Did I say I love making deserts? Did I also say I only make non-individual ones - cakes, pies, etc. It takes so much time to make individual cookies, where does one get all this time? But Purim is different. 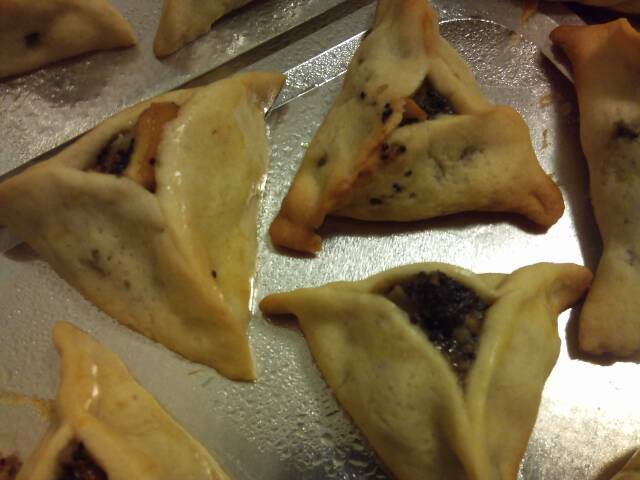 Purim is the only time of the year I make hamentashen (ozney haman, if you prefer). Every year I start being anxious and exciting about the affair, knowing that with my way of life (work and school) every hour is precious. Every time I dream of finding that magic dough recipe that will be easier and less sticky to make, I ask around... This year I even asked some kosher facebook "friends" of mine. Every year I end up making ... my own :-) And they turn out great. My only sadness this year that my little 19-year old is too far away to taste them. Really you can use anything you want instead of the usual filling - go wild, it's Purim! Add vanilla and orange juice. Add flour, backing powder and salt, mix and knead the gough a little bit until it forms the ball. Refrigerate overnight or for a few hours. When you are ready cut pieces of the dough you are working with and make sure to cover the rest of dough to prevent it from drying. With the rolling pin roll the dough and cut up rounds. 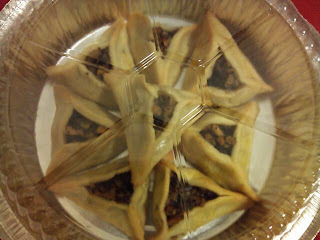 Place the filling inside and make triangle hat-like cookies. Bake for about 15-17 minutes at 350 F.